The warm weather "treat" has gone and it is plenty cold again. They say if you don't like the weather in Texas just wait til tomorrow and it will change, that's for sure. I am sure glad to see you today, we are going to have lots of wonderful food here to warm us up, with good laughs and fellowship to enjoy. I can't wait to see what you have brought today. Not Your Mama's Dip at The Rickett Chronicles Cheese Football at What's Cooking Love? Game Day Mac N Cheese at Winelady Cooks Super Bowl Eats Hun...Whats For Dinner? I've just linked up something for tea-time snack! Thank you for hosting! Have a nice day! Miz Helen, I have shared Crisp Coconut and Chocolate Pie and Cappuccino Chip Muffins. Thank you for hosting! Miz Helen, I meant to also say THANK YOU for featuring the Jalapeño Appetizers! Hi Miz Helen, thank you for featuring my Man Dip!! I have shared cookies, mini cheesecakes & our lunch together. Have a great week. xoxo & thank you for hosting!! This week I'm sharing a quick bok choy bell pepper stir-fry. It doesn't have a complicated sauce, just a little toasted sesame seed oil. Ohhhh, I'm definitely coming over for breakfast. That French toast is such a cute idea! Thanks for featuring my Cheese Football and thanks for hosting!! I shared a recipe for grain-free, pan fried wild flounder and an article about the new science on the dangers of sugar,as well as an article about healthy whole grains. Thanks for hosting! I posted a recipe for easy, medicinal chai that can be made to suit your unique health needs. Thanks for hosting, Miz Helen! Have a great day! Great selection of recipes! I've shared my chicken parmesan meatballs. Thanks for hosting! I'm sharing this week my "Dried-Fruits & Nuts Squares". amd ,u "Neapolitan 5-layer Birthday Cake"
Thanks for hosting this great party, and have a wonderful weekend! Thank you so much for hosting Full Plate Thursday! I've shared my Banana Oatmeal Raisin muffins this week. Have a lovely weekend! I think Full Plate Thursdays are one of my very favorite linkys. Always the best food from some of the best blogs out there. <3 Thanks for hosting! I have shared my brownie hearts. Have a great day and thanks for hosting! I was excited to see my gluten free super bowl foods featured this week. Thanks so much. I'm sharing an amazing idea for peeling a whole head of garlic in less than 30 seconds! It's a must see. Have a great week. Thanks for hosting! I love seeing what everyone has shared! I have shared Grover Cupcakes and Valentine's Cake Balls. Today I’m linking up my Grilled Smashed Potatoes and 2-ingredient Pumpkin Cake. Thanks for hosting, Miz Helen! There are so many fabulous looking recipes here this week, I've already been out and looked at a few! Thanks for featuring my dish. Today I linked up a stir fry. We love it. Thank you for featuring my valentine tarts! Today I've shared my recipe for creamy spinach pesto that we love served over pasta or spaghetti squash. I hope everyone has a wonderful day! Great choices this week. We linked up a wonderful beef and barley stew recipe today. Come visit. We shared some wonderful news about our blog yesterday! Hi Miz Helen-all I have to offer is my homemade Rye Bread, but it's so healthy w/crunchy crust, and really delicious. I'm so excited about all the beautiful Valentine's dessert linked up. Thank you so very much for featuring my Super Bowl Eats Rootbeer Pulled Pork, this week. Also, thanks for hosting one of my favourite linky parties, each week. Hope you have a blessed week! Always, ALWAYS making me hungry. Those Grover cupcakes are AWEEEEESOME!! 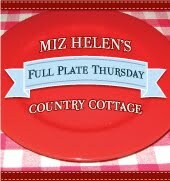 Hi Miz Helen, thanks for hosting another great week of Full Plate Thursday's! I'm sharing a Tunisian Cod with Chermoula recipe. Don't know what chermoula is? It's a yummy Tunisian marinade that is perfect on white fish or chicken. Have an amazing day! I already have three posts to share this week, wow. I’m a big blogging nerd. First is my final post on the GAPS Challenge. We are already in week four. What?! That went fast. This week I am sharing a Valentine’s inspired dish (the most beautiful vibrant red color): roasted beet, cabbage and green apple. Simple, healthy and delicious. I shared my Creamy Kale Salad and Tender Chicken Curry (made in the Crock Pot) recipes this week. Happy Thursday! Cheers! Hi Miz Helen! I shared my post on Oregano this week with a simple recipe for roasted vegetables! Have a lovely week and thank you for hosting! Thanks again for sharing my Superbowl Party Food! Really appreciate it amongst so many other great links! Miz Helen, thank you so much for including the V-8 Veggie Crackers in your menu this week. I am so humbled. I seem to not be able to stop making new ones. Onion crackers are up next. Today I bring Meat, Potato, and Egg Scramble. This is an expensive dish that can be made for breakfast, lunch, or dinner. Thanks you so much for hosting each week. Have a great one. Hi Miz Helen, thanks so much for stopping by my site, really appreciate it! I love your Full Plate Thursdays! I'm having trouble getting my link to work, it's not being recognised and since it's close to midnight, this homeschooling mum of 4 is calling it a night and will try again next week! I've bookmarked you so I shan't forget! For winter, soup is always good, so I've brought some Napa Cabbage Soup. The delicate flavor of napa cabbage is enhanced rather than overwhelmed in this low-carb, gluten-free, casein-free soup. Thank you so much for the feature, Miz Helen! Thank you for hosting another great party! Thanks for hosting, Miz Helen! I didn't share a recipe per se', just a success turning around a failed caramels attempt. This is my first time visiting. Thank you for your hospitality! I'll be sure to come back again! Thanks for hosting! I am sharing my Mint Garlic chicken recipe with lime pepper corn salad and hope you will like it! Yummy goodies! Happy Friday! Feel free to stop over and link up this linky and anything tasty in my Valentine link up today. Everything linked up today will get a p Pin on Pinterest :) Have a super weekend. Found your blog via my friend at Cajun Delight, and so glad I did. Lots of deliciousness going on here. Some of the women in my old neighborhood used to swap out leftovers to stretch the budget. What fond memories. I may have just missed it, but is your cookbook available for purchase? Hooray! I finally visited before your party closed! Now I'm off to check out your luscious chocolate cake below! Hi Miz Helen, I'm a little late this week, but I want to thank you with all my heart for featuring my game day mac & cheese. You are the quintessential hostess. I am honored and flattered. Thanks for the great linky party! Such a great bunch of recipes to check out. We just added a Warm Spinach Dip made in the crock-pot.